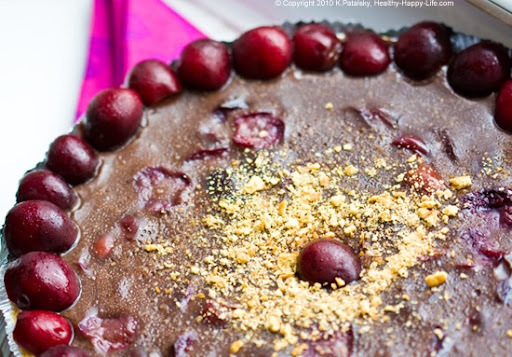 Vegan Chocolate Cherry Pudding Pie-fait. 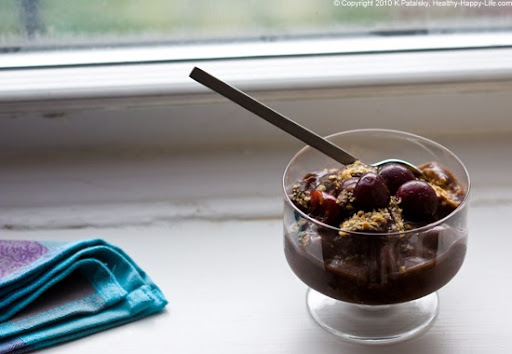 No Bake! If you haven't purchased a big bag of bright red, fresh summer cherries yet this summer - what are you waiting for? 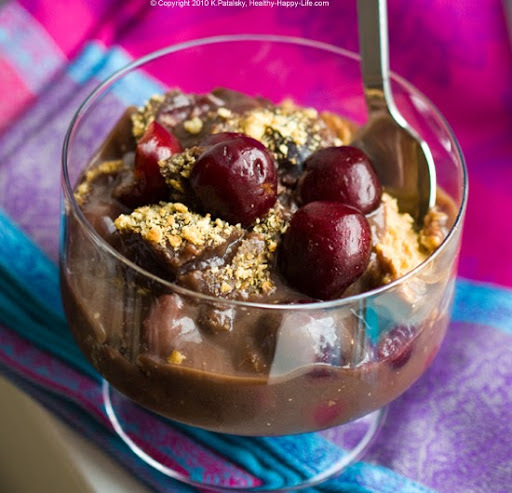 Snag a splurge-worthy bag or find some on sale - so you can make this luscious, no bake, vegan dessert. Cherry Anxiety! One large, 2.75 lb bag of cherries on sale: about $12 here in NYC. I was so excited about my giant bag of cherries, but when I got home from the store I was startled by the sudden onset feeling of: cherry anxiety!! ..Oh no, what if my cherries go to waste? How am I going to eat all these cherries in a few days? What do I do, make, eat now?! So in my cherry panic, I started pitting. And pitting. And pitting. And no, I do not own one of those handy dandy Martha-Stewart-esque easy-breezy cherry pitting devices. I did all 2.75 pounds of cherries by hand. Cherry-stained fingernails and all. Summer Cherries. I love cherries. Sweet and tart and loaded with heart-skin-body healthy antioxidants. 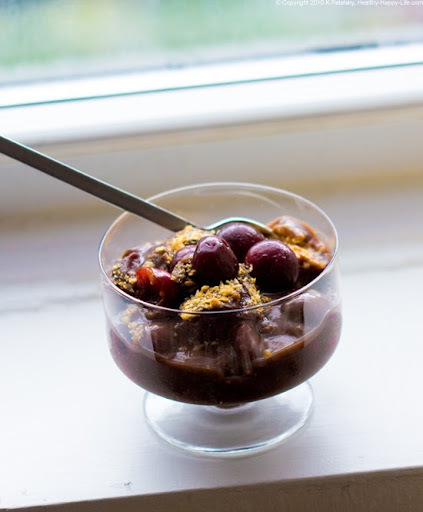 See why I think they are worth the sometimes hefty price tag: cherry price-justification and nutrition facts. Tofu or No Tofu. I like this recipe with silken tofu. But if you do not have silken tofu on hand you can simply sub the tofu with 1 3/4 cups of soy milk - yes the consistency will be a tad softer. NEW! 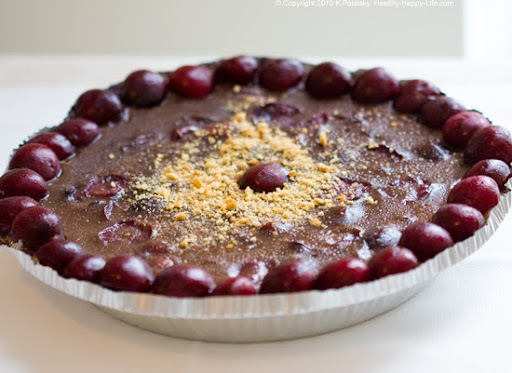 I just added an easy topping for this pie or pie-fait. 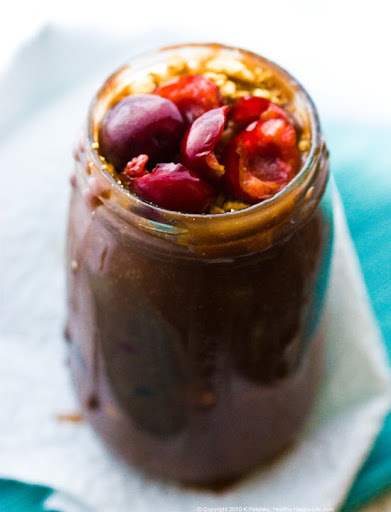 Tart Cherry Juice Sauce!.. optional: 1 tsp cayenne for a spicy layer of flavor and/or 2 Tbsp of grapeseed oil for added richness. 1. 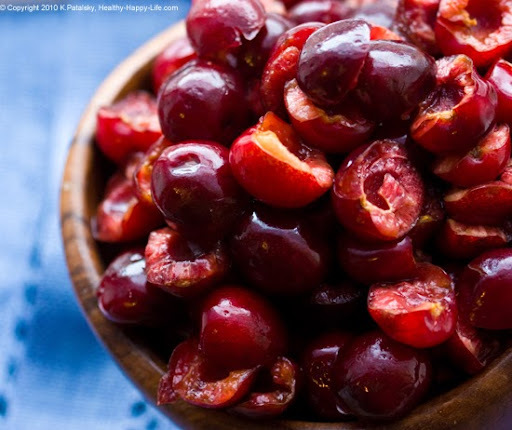 Wash, pit and halve all your cherries. Reserve about 3/4 cup fresh cherries for garnishing and layering. Prep your grahams for layering or for crust by crushing by hand or in food processor. If you are using tofu, it will be significantly lumpier. 3. Add in the vanilla extract, cocoa and cinnamon. If you are using tofu, take a break (allow mixture to cool for a minute) transfer your mixture to a food processor or blender - carefully blend until smooth. Transfer back into soup pot and continue process..
4. Your mixture should be smooth now. Add in your cherries (except for the reserved cherries). 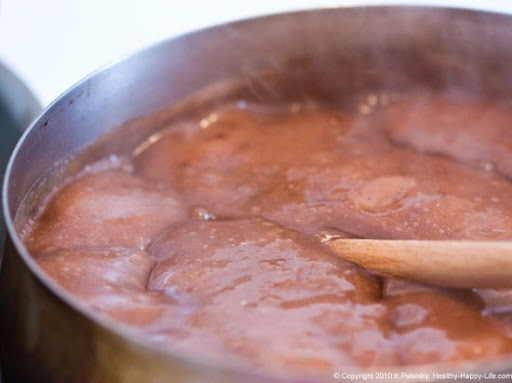 Bring mixture to a boil and stirring constantly, allow to boil for 5 minutes on medium heat. 5. 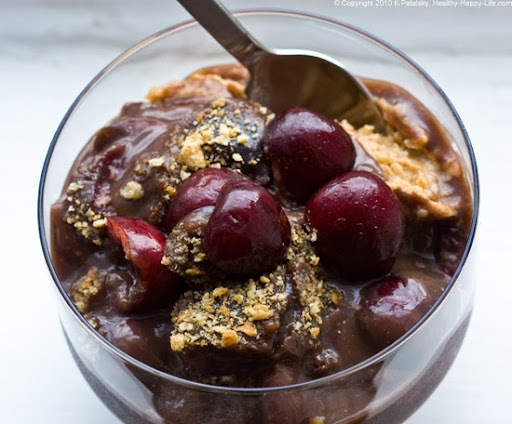 Turn off heat and immediately pour cherry/chocolate mixture into prepared graham pie crust - or layer with crushed grahams and fresh cherries in parfait cups. 6. Garnish with the reserved fresh cherries. 7. Place your pies/parfaits into fridge to chill - preferably overnight, but minumin of 2 hours. 8. Serve parfait cups. If serving the soft-serve pie you can either spoon large slabs onto a plate or spoon large slabs into dessert cups. The consistency is that of a soft custard pie. 9. For the sauce, I like to make mine right before serving so it is still warm and sticky. Simply dissolve the corn starch in the cold cherry juice. Place all ingredients in pot on stove over high heat. Stir until the mixture thickens. Pour. 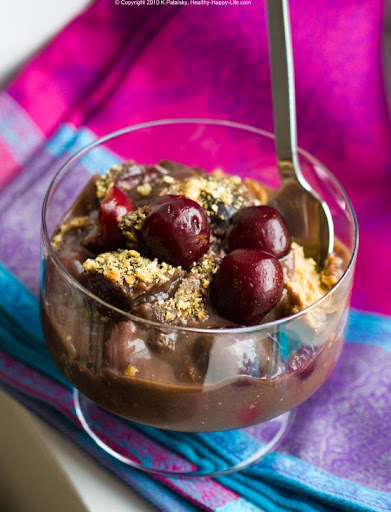 Allow to cool a tad and drizzle over top dessert!